Looking for a Valentine’s Day treat and a little symbolic PDA to go with it? 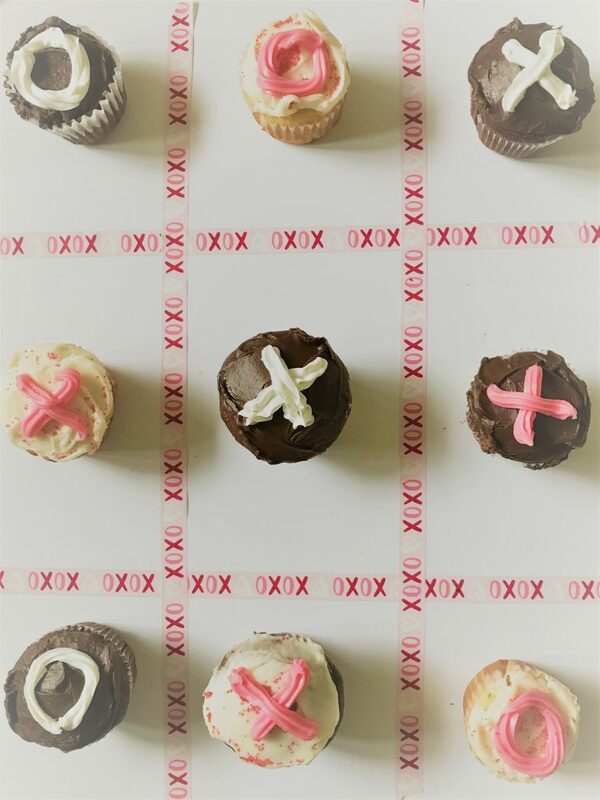 Take a look at these easy-to-make XOXO Hugs & Kisses Valentine’s Day Treat + Tic Tac Toe Board Free Printable! 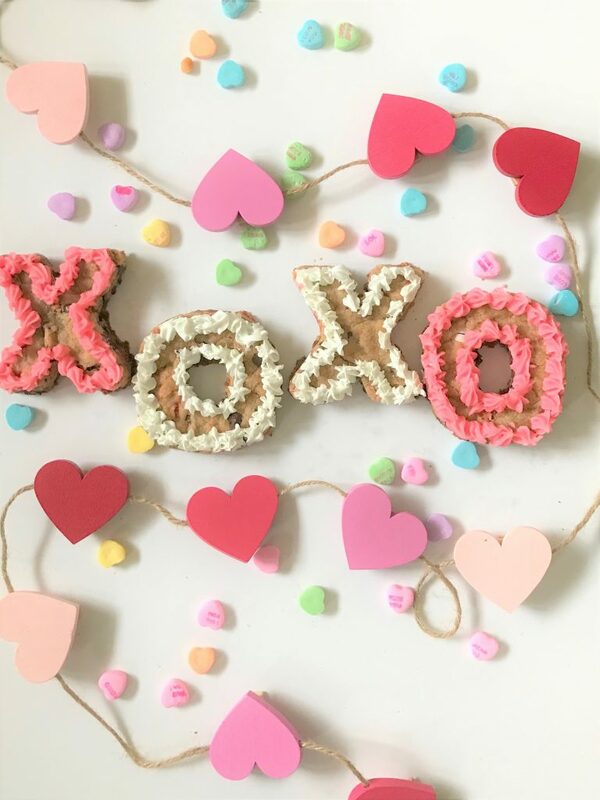 As a former semi-melodramatic middle-schooler who may or may not have worn black on Valentine’s Day, I found it a little comical that my kitchen was filled with all kinds of Valentine’s Day goodies this weekend. Thank God we move past our middle school selves, right? Even now, my husband and I aren’t huge Valentine’s Day celebrators (he thinks it just a huge marketing scheme), and we’ve been known to ‘float’ a Valentine’s Day date or two. But since we’ve had our boys, every holiday becomes so much more fun again. The twins are almost 3 now and just starting to ‘get’ what each holiday is about…and I mean, how can I deny them the fun of celebrating Valentine’s Day?!? 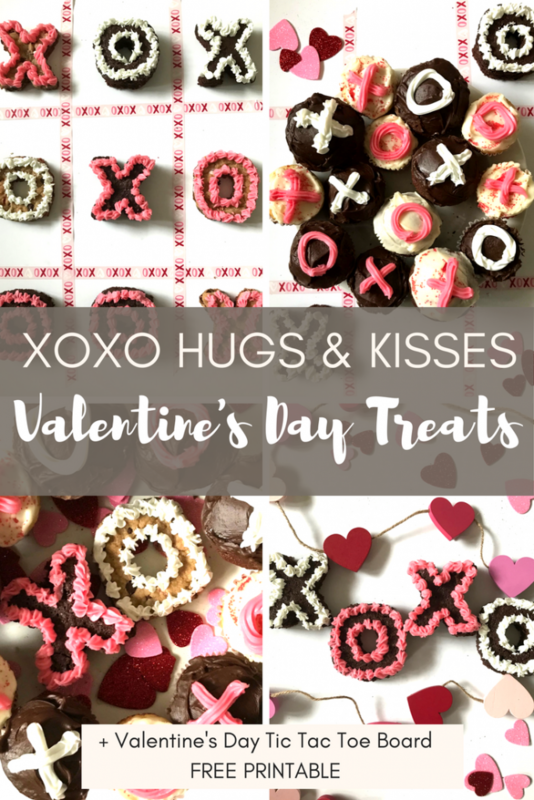 Today, I’m sharing some XOXO Hugs and Kisses treats as well as a Tic Tac Toe game to go with it – a little bit of extra free fun. 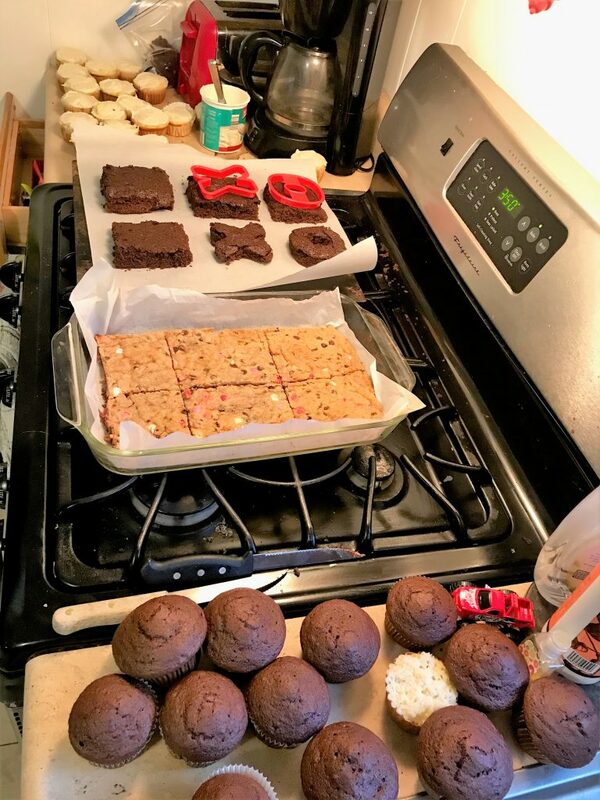 The cookies bars, cupcakes and brownies are no brainers, as far as baking them goes (I just used a box mix, but feel free to use your favorite from-scratch recipe. Sorry! This mom doesn’t have time for that!). My boys were so excited about “Christmas cookies” (“No, no, honey. That was the last holiday. 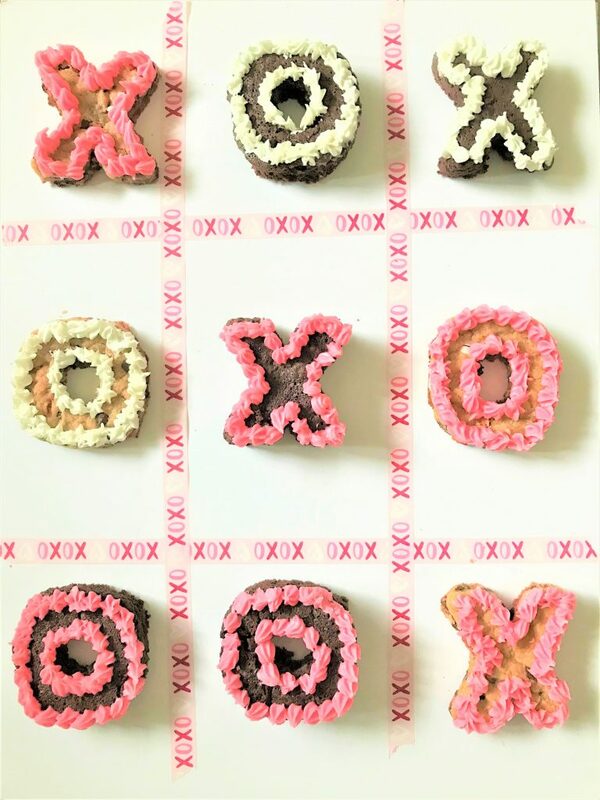 These are Valentine’s Day cookies!” ) and gave me a hand in the stirring and baking. That’s probably the most fun part for me – spending time with the kiddos and seeing them get so worked up over it. Feel free to get your kids involved! I know it makes everything take a little longer, but these are childhood memories in the making! It’s pretty easy stuff, kitchen-wise, and there are lots of tasks involved that are on their level. 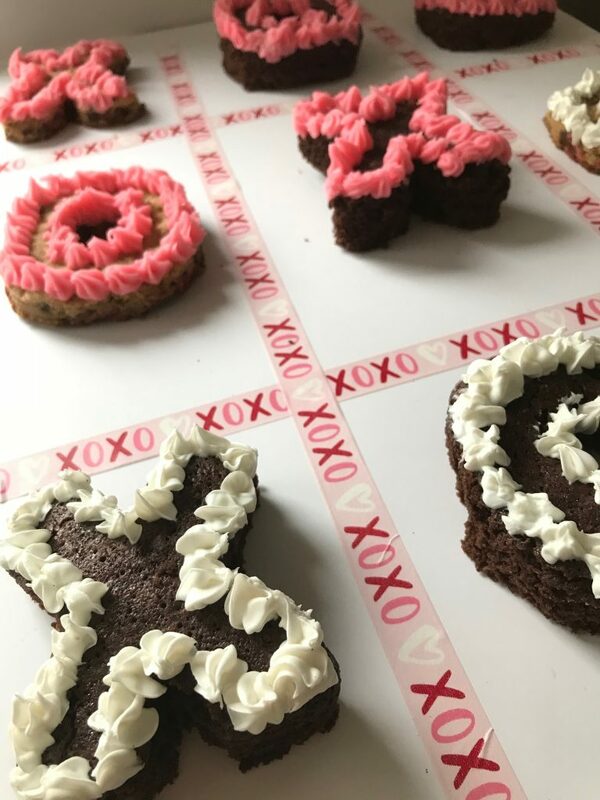 XO Cookie Cutters – I found these great cutters at Walmart for $1.49 in the Valentine’s Day baking section! It was a total score because they were a little tricky to find. 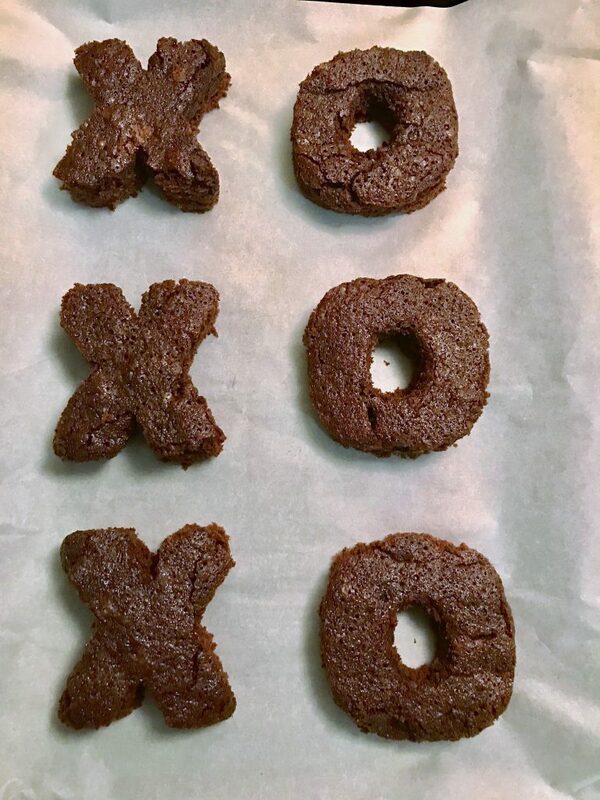 Wilton’s sells a cookie cutter set also, but the XO are a little small, better for smaller treats. That would be suitable if you need to make a big batch of treats, for a class party or something like that. 1| Bake cookies bars, cupcakes, and brownies according to instructions on box. I baked all of them simultaneously as a batch, then decorated them as a batch. Your system is up to you, but with little ones around, I found it easier to get all of the baking done in one shot. I used a mix of chocolate chip cookies for the cookie bars plus a 1/2 bag of Valentine’s Day M&Ms. To make cookie bars, make cookies according to instructions. Then, place parchment paper in a 13×9″ baking dish or cookie sheet with a lip. Place cookie dough in the dish and flatten by hand until it is evenly pressed down over the whole area. I used one box of brownie mix in a 13×9″ glass dish. I used 2 boxes of cake mix for the cupcakes: white cake and chocolate cake. Each box yielded about 16 cupcakes. 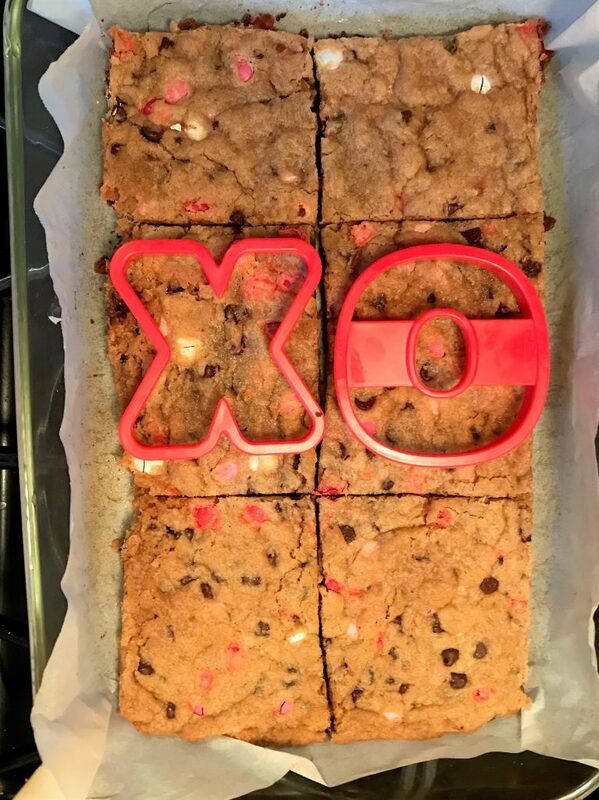 2| Cut out the XO shapes from the cookie bars and brownies. 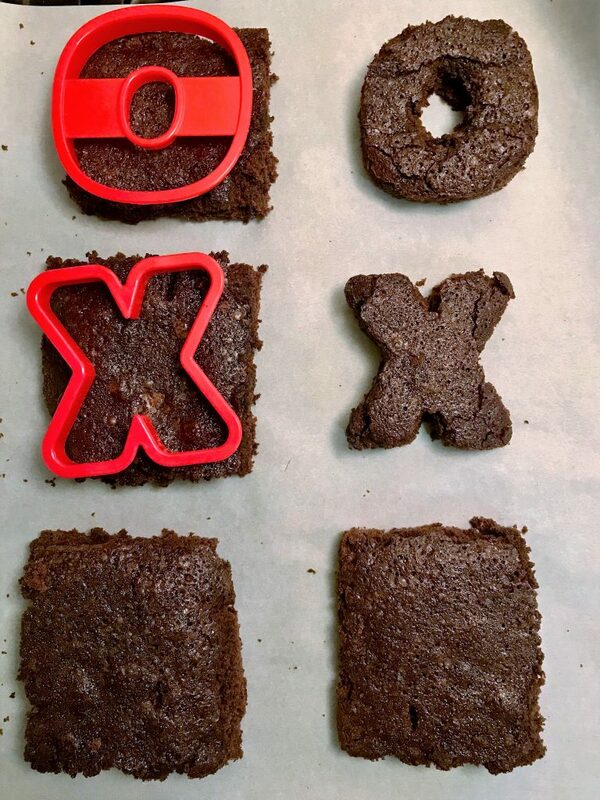 For this part, I cut the cookie bars and brownies into 6 pieces, then used a spatula to remove them from the pan and put them on a flat surface to press out the XO. 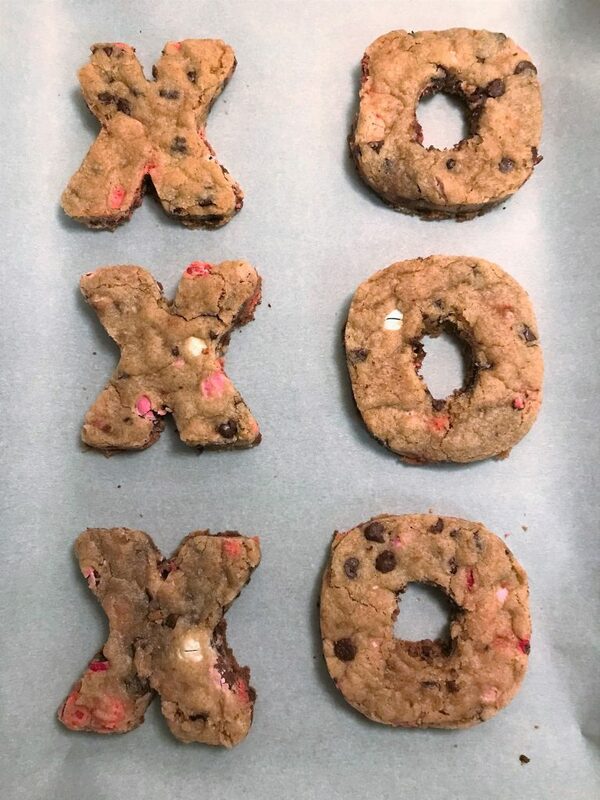 Once the pieces are removed, use the cookie cutters to press out the XO. Your cookie bars and brownies might be thicker than the cutters themselves. If that’s the case, press the cutter down until it touches the top surface of the bar or brownie. Then, remove the extra edges from the side. Once the extra is gone, then you can press down the rest of the shape. Otherwise, the cutter could bend the top surface and possible break it. I realized after the fact that it just might have been easier to buy chocolate donuts, lol. If you don’t mind shortcuts, Duncan Donuts Chocolate Glazed Donuts would probably work great! 3| Have fun and decorate! 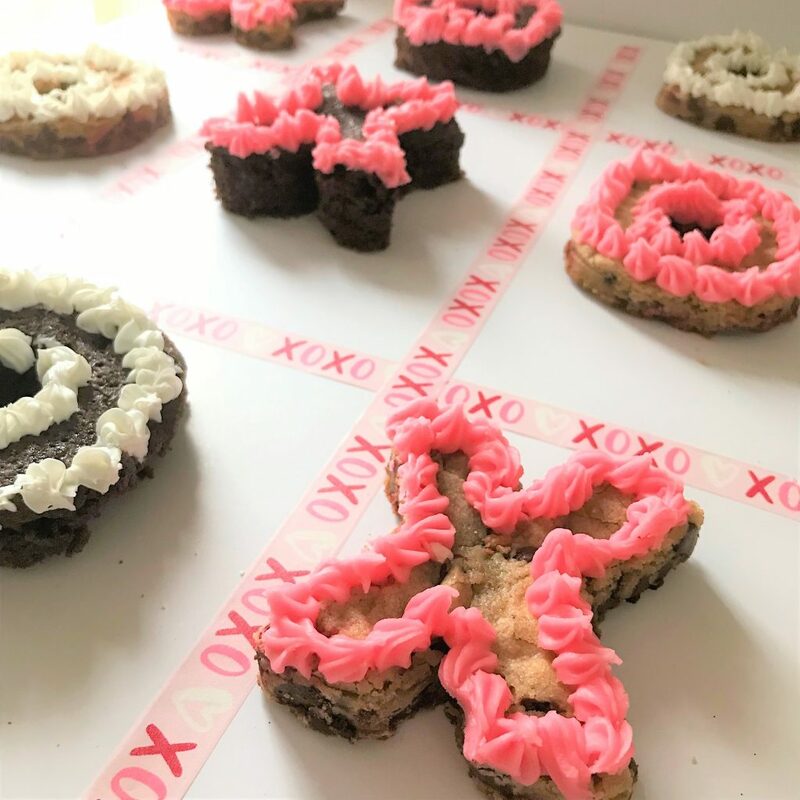 I used the icing tips to make little flower poofs around the edges of the Xs and Os on the brownies and cookie bars. 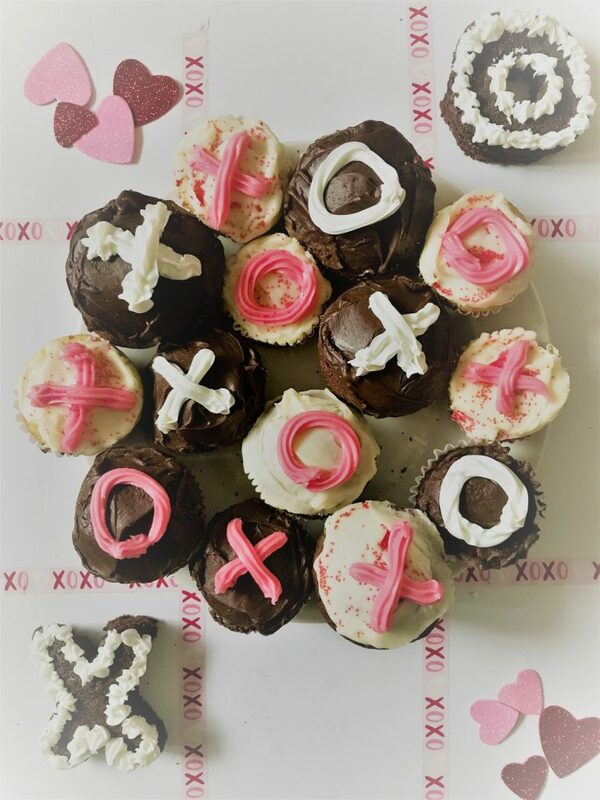 I frosted the cupcakes as usual with regular frosting and then drew the “X” and “O” on the surface with the decorating icing. Experiment with the color combinations. I made white cake cupcakes, cream cheese frosting with pink icing on top. I also did chocolate cupcakes with both cream cheese and chocolate frosting. For the white frosting, I used pink icing; for the chocolate frosting, I used white icing. 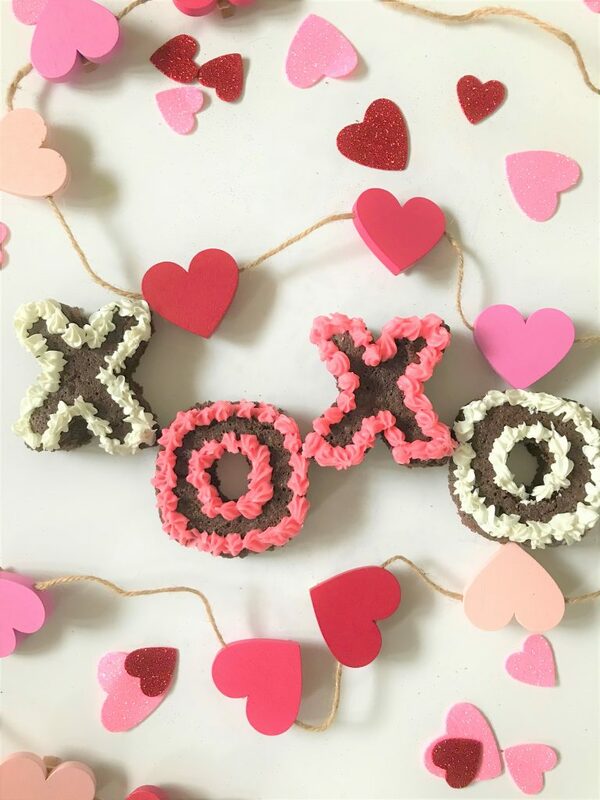 As I mentioned, you can also make a Tic Tac Toe Board and have a little Valentine’s Day fun! 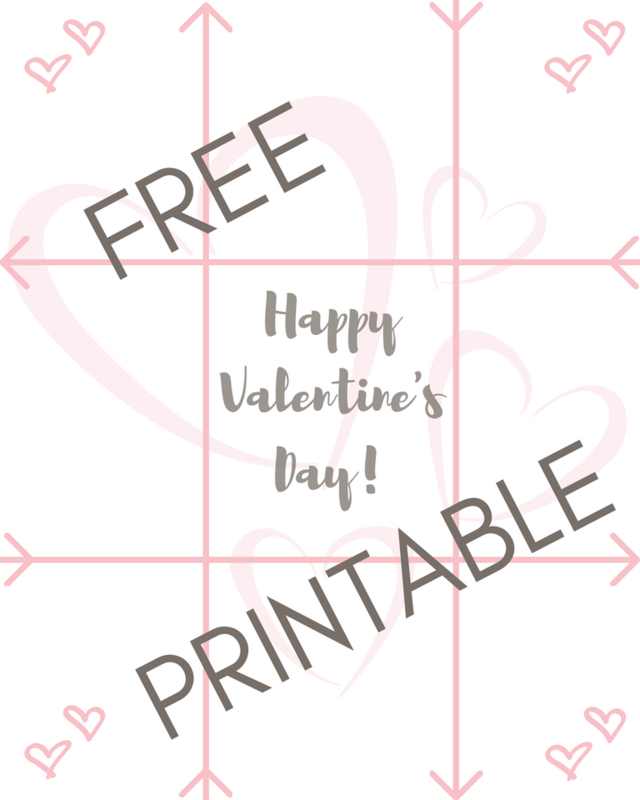 You can download a free printable Valentine’s Day board (8×10″), which is perfect for the cupcakes. Just fill in the box below to get yours! 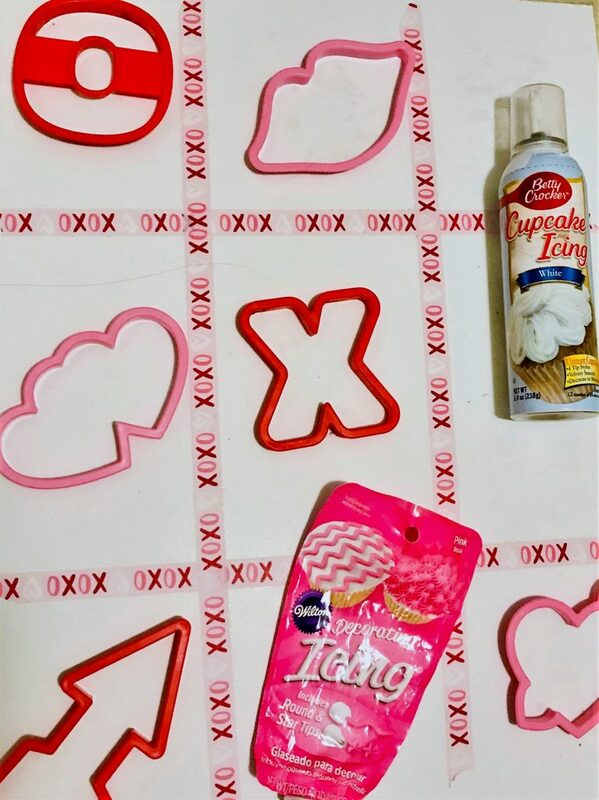 You can also make your own with Valentine’s Day Tic Tac Toe board with washi tape (I got mine at the Target Bulleye Playground – the dollar area) and a piece of foam board. That would work perfectly for the bigger brownies and cookie bars. All in all, this was a pretty easy project to put together. 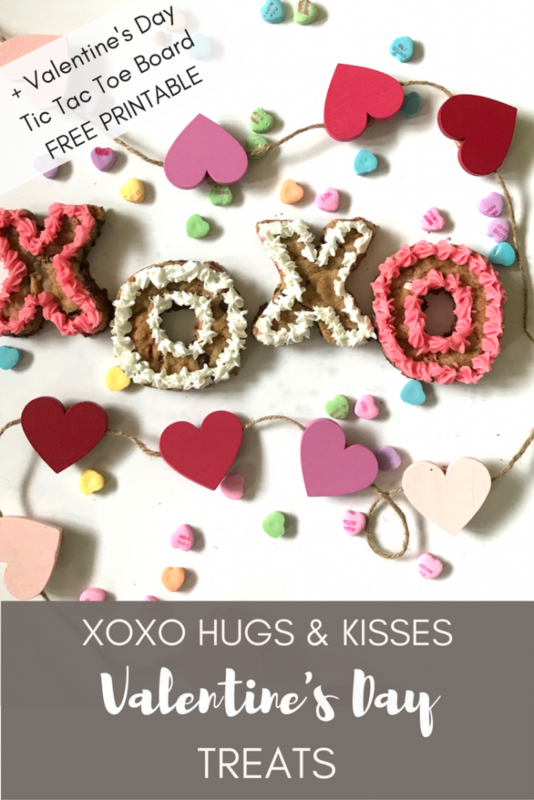 XOXO Hugs and Kisses is one of my favorite sign-offs, and the best PDA, by the way! Perfect any day, but especially for Valentine’s Day! Do you have any special traditions you love to do with your kids? What are your favorite treats – to bake or to eat? I’d love to hear! If you know anyone who would enjoy this idea, please share! Very cute. This definitely would be fun to bake with my girls. Love the tick tack toe idea. I'm so glad, Christina! I think these would be really fun to bring to class as well! If you end up doing it, I'd love to hear how it goes! So fun! Even I can bake from a box, too!!! This is really cute! I love how simple it is too! This is such a cute idea! I think this might be the Valentine's Day treat I send to my kid's classrooms. My kids will have a ball making them too! Thanks for joining #WanderingWednesday at Confessions of Parenting.